Ask ten different executives “What is a global company?” and, more likely than not, you will get ten different answers. Some might argue that a global company is one that is pursuing customers in all major economies, in particular the Americas, Europe, and Asia. Others might argue that you are not really global unless you put down roots in every major market in the form of producing locally what you sell locally. Yet others might suggest that the real test of globalization lies instead in whether your business unit headquarters are globally dispersed, whether your top management team consists of individuals from different nationalities, and so forth. There are two problems with each of these perspectives regarding the nature of a global company. First, each definition overlooks the fact that globality is a multidimensional phenomenon and, like the proverbial elephant, can never be understood fully from just one perspective—be it market presence, production bases, composition of the top management team, or any other. Second, each definition overlooks the fact that globality is a continuous variable along a spectrum from low to high rather than a categorical binary variable with only two extreme values (global and nonglobal). 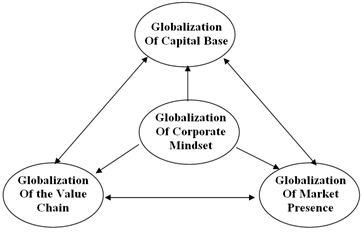 As depicted in the figure below, we believe that the concept of “corporate globality” should be viewed as a four-dimensional construct based on the premise that an enterprise can be more or less global along each of four major characteristics: globalization of market presence, globalization of the value chain, globalization of capital base, and globalization of corporate mindset. The first dimension, globalization of market presence, refers to the extent to which the company is targeting customers in all major markets for its industry throughout the world. Even within the same industry, globalization of market presence can range from relatively low to very high. For example, in 2013, Wal-Mart generated 29 percent of its total revenues from outside the U.S. In contrast, Target and Sears generated 100 percent of their revenues from within the U.S. and none whatsoever from foreign markets. The second dimension, globalization of the value chain, refers to the extent to which the company is accessing the most optimal locations for the performance of various activities in its value chain. It is entirely possible for a company to have fairly local or regional market presence and yet a highly globalized value chain or vice versa. For example, the British retailer Marks & Spencer has long relied on a global supply chain for apparel goods with manufacturing hubs in Portugal, Morocco, and Sri Lanka. Caterpillar Inc. represents another good example of a company with a global value chain. Caterpillar delivers products to customers in nearly 200 countries, operates manufacturing centers in more than 24 countries and has research and design technical centers in more than 9 countries. Thus, Caterpillar’s value chain represents a complex global network of sourcing units, manufacturing centers, parts distribution centers, logistics centers, marketing offices, dealers, and customer locations. The third dimension, globalization of capital base, refers to the extent to which the company is tapping into the most optimal sources of capital on a worldwide basis. Baidu, China’s leading Internet search and online advertising company, represents a good example of how it is entirely possible for a company to be quite “local” along the dimensions of market presence and supply chain and yet have a highly globalized capital base. Baidu’s market base and operations are centered primarily in China. Yet, the only exchange that Baidu is listed on is the U.S.-based NASDAQ. A listing on the NASDAQ potentially yields many benefits for Baidu: access to a broader base of investors, greater international visibility, enhanced ability to use stock options for attracting top talent, and enhanced ability to make stock-based acquisitions. Last but not least, the fourth dimension, globalization of corporate mindset, refers to the extent to which the corporation as a collectivity reflects an understanding of diversity across cultures and markets coupled with an ability to integrate across this diversity. The state of any enterprise’s corporate mindset depends on the mindsets of the individuals who lead the enterprise as well as the organization that determines how these individuals interact, what information is collected, how it is processed, and how decisions are made. General Electric serves as a good example of a company with an increasingly global mindset. All GE businesses are managed through a global line-of-business structure, investment opportunities are identified and assessed on a global basis, corporate leaders are pushing hard to globalize “the intellect of the company,” and, while the company has a strong worldwide corporate culture, the composition of the leadership itself is becoming increasingly diverse in terms of nationalities.